Graduate student guard Taylor Campbell dribbles the ball up the court during women's basketball's game against Towson Thursday night. Women’s basketball got off to a quick start and never trailed in its matchup against Towson Thursday night. In their first win of the season, the Colonials (1–2) shut down the Tigers (0–2) on the defensive end and stormed to a 66-43 victory. Three games into the season, head coach Jennifer Rizzotti said the team showed substantial defensive improvement during the contest. 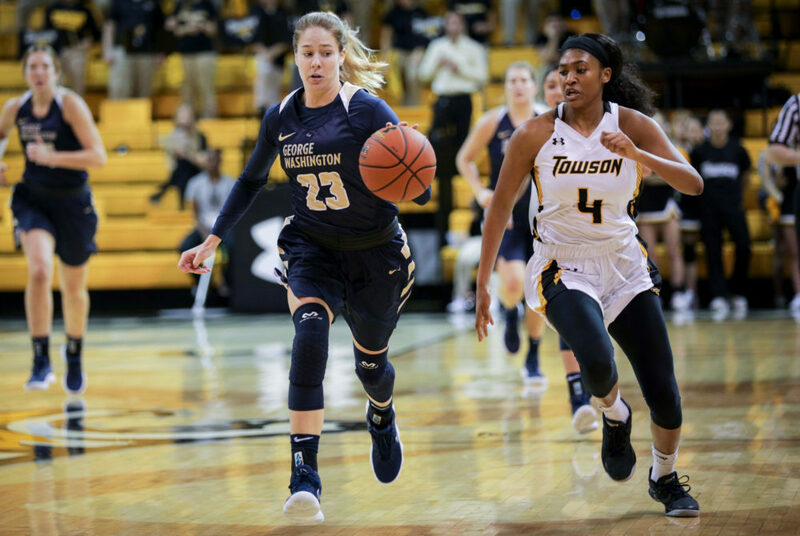 GW shot 42.1 percent from the field on the night and limited Towson to just 32.7 percent, but struggled in the second quarter to maintain its attacking presence. Freshman forward Neila Luma – who found herself in the starting lineup for the second time – grabbed a team-high nine boards along with six points and a block. Cummings led the game with 17 points, five assists and five rebounds and junior forward Kelsey Mahoney picked up 12 points and three assists on the night. Cummings also finished with three of GW’s 10 steals. Rizzotti said seeing Cummings step up in the game was a long time coming. The Colonials got off to a fast start, hopping out to a 11–2 lead with 7:06 left in the first quarter. The team led by as many as 12 points and held the Tigers to just 25 percent shooting in the frame. A buzzer-beating three-point shot from freshman guard Lexus Levy solidified a comfortable 27-11 lead for the Colonials heading into the second quarter. The Colonials faltered in the second quarter after the Tigers switched to a zone defense. Towson went on an 8-0 run at the beginning of the frame and looked to be back in contention. The Tigers improved to a 37.7 shooting percentage from the field while holding the Colonials to just two made baskets on 12.5 percent shooting in the quarter. Towson’s defensive changes after the first quarter caused the Colonials to lose their offensive flow, Rizzotti said. Mahoney and senior forward Kelli Prange were the only Colonials to find the scoreboard in the second frame. The Tigers got within five points before Mahoney made a contested layup to stretch the score to 29–22. At the halftime break, GW rebounded from a cold second quarter and outscored Towson 21-9 in the third. Cummings finished a timely three-point play to swing the momentum solidly in GW’s favor and a steal in the backcourt from Levy gave the Colonials another quick possession. With seconds left in the third quarter, Mahoney was open from 30-feet out and sank a three to push the GW lead to 52–33 heading into the final break. The Colonials held the Tigers to just three made shots in the fourth quarter and continued building on their lead, outscoring Towson 14-10. The night’s game was a reunion for players on the Colonials roster and members of the Towson coaching staff. Tigers head coach Diane Richardson and assistant coach Zach Kancher coached GW – and five current Colonials players – two years ago. The Colonials return to the Smith Center Sunday to face off against Georgetown. Tip-off is scheduled for 2 p.m.